UNIPOWER can supply a wide variety of outdoor power cabinet solutions that can providing protection and thermal management in a range of harsh outdoor environments. 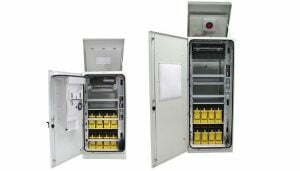 Cabinets can include complete AC distribution and earth connection points and house the power system, DC distribution, system controller and provide space for mounting telecommunications equipment. We work with a number of regional enclosure experts to provide the bespoke solutions for customer requirements. A variety of mounting options are available including floor-standing, wall-mount or pole mount. For more information and to discuss your application please contact sales.